Rhododendron Removal - How to Get Rid of Rhododendron? Rhododendron ponticum is a large evergreen shrub or small tree introduced to Britain in the 18th century. It is a very attractive dark green leaved shrub with showy trusses of flowers. In its native habit, it grows as an understory plant in mixed forest or as a dwarfed form above the snowline. The plant is now found as a native in two distinct zones: one extremely extensive – Eastern Europe (SE Bulgaria and NW Turkey) eastwards to beyond the Black Sea to Transcaucasia, and south to North Anatolia (hence its specific epithet ponticum, from Pontos); and a second, smaller area – the Iberian peninsula. These two zones are the surviving parts of a much larger range in western Eurasia in the Tertiary period; the fossil record shows it to have existed in Central Europe and as far north as Ireland even more recently, in one of the interglacial periods. Some authorities see the Iberian population as a distinct subspecies, subsp. baeticum, distinguished from the species by invariably having a densely short-hairy stem to the inflorescence. Often viewed now as an escaped garden ornamental, it was also in earlier periods extensively planted as game covert and was also used as the rootstock onto which many later Rhododendron hybrids were grafted. All of these means of introduction into the wild mean that it has taken hold in many areas of Britain, and particularly forms expansive thickets in the milder areas. It has also hybridised with several other species, for example R. maximum and R. catawbiense. The seed can remain dormant in the soil for several years and will germinate when conditions are favourable. Evergreen shrub or small tree up to 8m tall. Long oval shaped leaves, 10 – 20cm long, dark green above, paler and hairless beneath with a leaf stem 1 – -3cm long. At the end of the branchlets with up to 15 flowers on a stalk opening in late spring. It has flowers which appear around May – June. Calyx very small, with 5 blunt teeth c.25 mm long; corolla bell-shaped, c. 5cm wide, 3.5 – 5cm long, lilac, often with a pinkish or purplish tinge, and with green-yellow spots in throat; individual flower stalks c. 2 – 4cm long, hairless or slightly glandular-hairy; 10 stamens, filaments hairy at base, ovary and style hairless. This involves physically clearing all the plants from the designated plants by hand or with machinery. The strategy is often dependent on the topography, with the plants being often found on craggy areas inaccessible to heavy machinery an element of intense labour is often required. 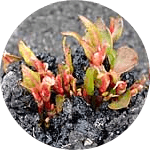 All plants should be cleared down to ground level, stumps appropriately treated, debris chipped or burnt and small growth chemically treated. Typically methods of clearance are via chainsaws and forestry mulchers although larger forestry machinery can be used in certain situations should the tree density allow it. Stumps can often be winched out of the ground to remove the most viable sections of the plants root system however this can present issues to man and animals. An on-going monitoring and chemical treatment regime or hand pulling should then be implemented for a number of years until both the seed bank and root system are depleted. It is feasible on some sites to implement a chemical control programme to achieve eradication of this species. Herbicides are applied to all plants below 1.3m in height via knapsack sprayers, all plants above this are injected with herbicide at specific points. 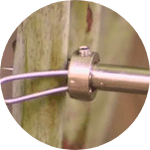 When undertaking injection works some element of hand clearance will obviously be necessary to create access to the relevant sections of the plants. The treatment programme should be regularly reviewed to ensure that the herbicides are been applied at the correct growth stage and in the correct manner. Any amendments can then be easily made to suit the sites specific needs. Eradication can take a number of years to be achieved depending on the size of the seed bank and root system. If you have concerns over Rhododendron on your land, if you are unsure of your legal responsibilities, or, if you would like a quotation for control, please contact one of our specialist surveyors. Treatment costs start from £380.00 + VAT.